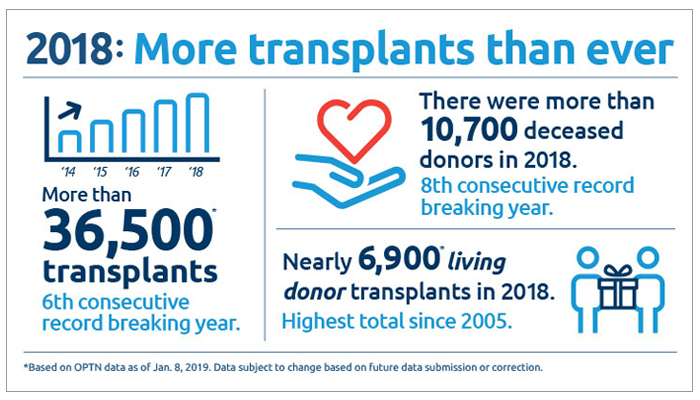 Thanks to the gift of life from organ donors and their families, the number of donors and transplants performed in the United States are at all-time highs. View the latest data about the status of U.S. organ donation and transplantation by UNOS region of center, by state of center and individual transplant centers. While 2018 was a record-breaking year, the need for organ donors is immense. On average, 18 patients died every day waiting for a transplant in 2017. * More than 6,500 candidates died in 2017 while on the wait list, or within 30 days of leaving the list for personal or medical reasons, without receiving an organ transplant.